Platform for creating and managing native mobile applications for the iOS and Android stores. Swizi is a platform for creating and managing native mobile applications for the iOS and Android stores. It enables users to rapidly create mobile applications with the most sought-after features without technical know-how. What if it were possible to roll out applications with a customised appearance and features into stores in under two weeks? Create unique services thanks to an open platform that also enables IS integration with its API and plugin offering. 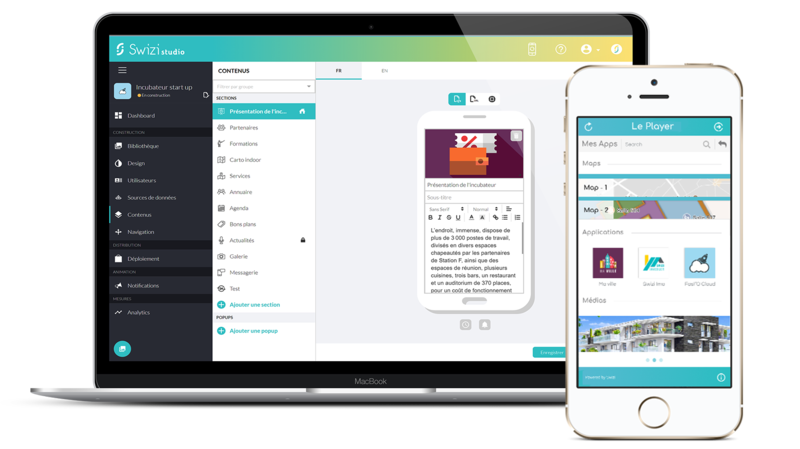 With the Swizi Studio, it is possible to configure mobile applications without technical know-how thanks to a unique, inviting and user-friendly space. Collaborative features for working effectively in a team, with secure role management. A mobile application available on Apple Store and Google Play for checking how the mobile app looks and behaves before rolling it out to the stores. Offer your mobile users geolocation features such as POS locations or directions. Each geographical content element can be adapted to each user and contextualised according to their profile. The segmentation feature also enables notifications to be sent depending on users’ positions. Send manual or programmed push notifications to your mobile users. Improve visibility thanks to customisation and segmentation options. “We designed Swizi so as to more effectively assist private and public companies in their digital transformation, enable them to easily adapt to the constantly changing behaviour of mobile users and thus support their requirements for competitiveness. With Swizi byOpen, we are meeting our users’ expectations in terms of independence, controlled budget, short time to market… the many criteria that are essential for a successful mobile application.” comments Olivier Raveneau, Swizi Product Director.